The JDE&S Committee was set up to deal with all matters relating to Judges, Demonstrators, Education and Speakers. The committee consists of a representative and deputy for each discipline and meetings are held on a quarterly basis. 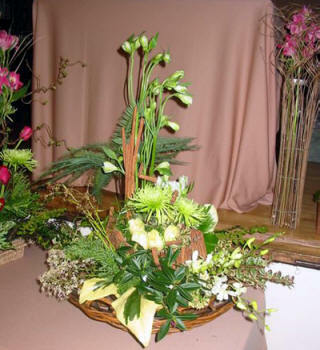 Presentations are given to flower clubs by Demonstrators and Speakers whilst in Education, teachers will do workshops and take classes. This is an important part of our Association since this is where we attach our charity status. 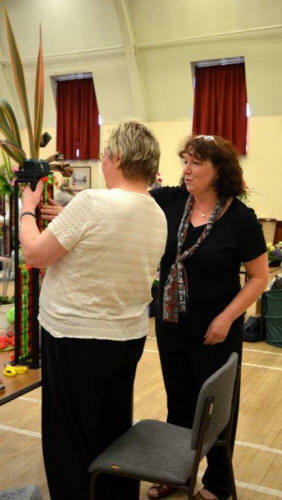 Judges may be asked to judge horticultural, Area or even National shows. 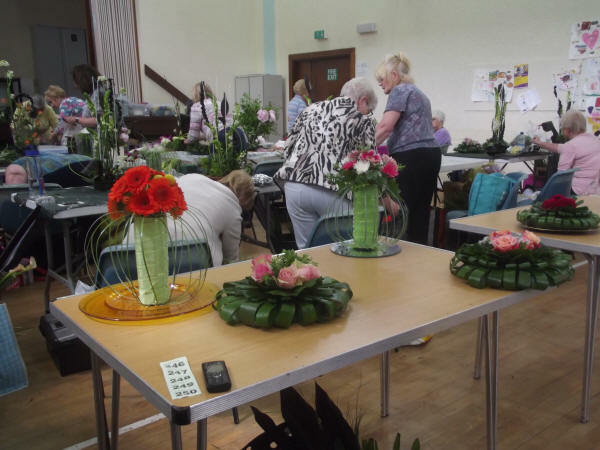 Past SAFAS Education Days have been both instructive and enjoyable, and the Education Days held at Cupar on the 11th of June, and Newton Mearns on the 12th of June were no exception. 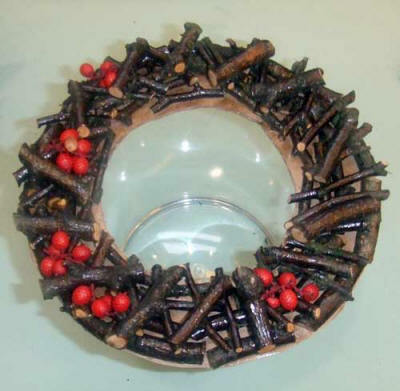 Our tutor was Kate Edwards, a National Teacher from Mercia and North Wales Area, who specialises in manipulating plant material to produce delightful, innovative designs. 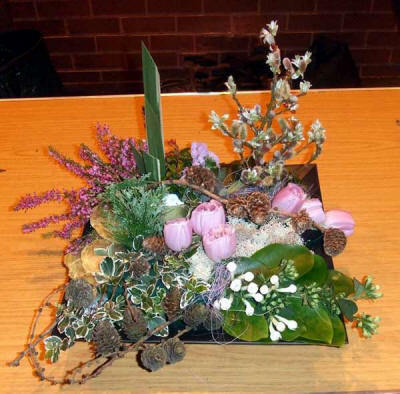 Plant materials used in these workshops were Bear grass, Black Ti leaves, and Rhapis palms, the latter being new to many participants. 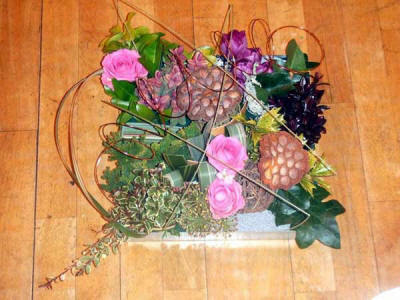 The designs were suitable for beginners and experienced flower arrangers, and Kate was impressed with the concentration and hard work which produced such good results. Kate was a lovely tutor who spent her time helping and advising her pupils. 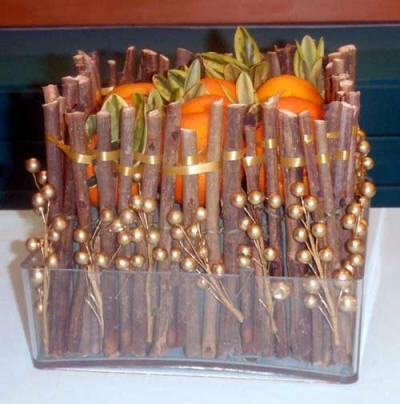 This resulted in plans being made for how the completed designs could be used for forthcoming lunches, dinners etc. and some discussion even took place as to how they could be adapted for Christmas! 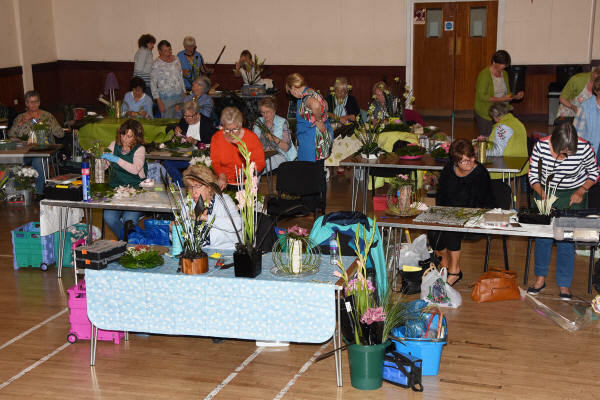 So many people helped make the Days a success, including SAFAS Chairman Mrs Irene Young who gave the Introduction and Vote of Thanks at Cupar, Linda Soutar and Sandra Hughes who helped and did the raffle, ladies from Cupar Floral Art Club, and Mary Whyte, who kept us supplied with tea and coffee. 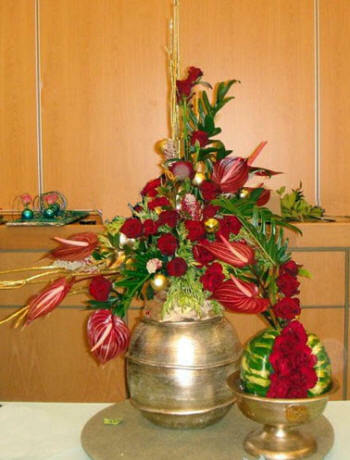 Thanks must also go to members of the JDE&S Committee, and all who promoted these Days. Finally, a big thank you to all the SAFAS members who attended, some of whom travelled considerable distances, for their support and enthusiasm which made these Days so rewarding. 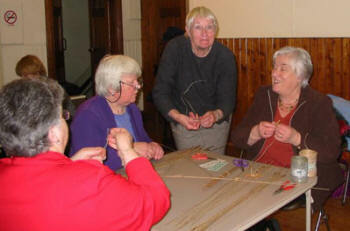 A selection of the Education Day run by Mary Law & Audrey Buchan. 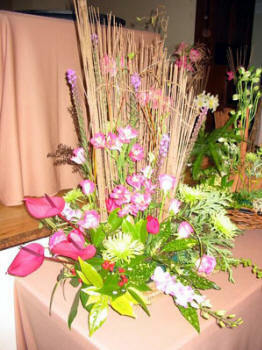 A selection of arrangements assembled throughout the day. 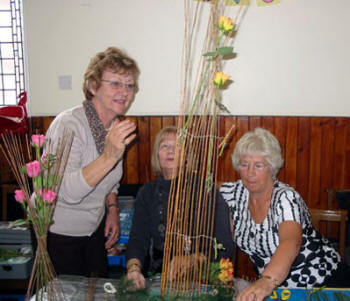 Participating members also Audrey Buchan and Mary Law; 3rd and 1st from right (below). JDE&S proudly presented the "S" Factor, a celebration of SAFAS talented Speakers on Friday 1st July 2011 at the Corn Exchange in Cupar, Fife. 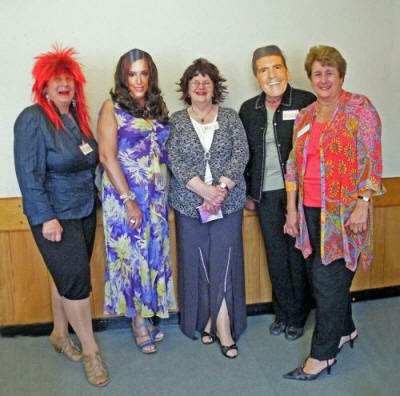 The Photographs show the fun presentations that the members enjoyed on the day with excellent Talks by our 4 National Speakers and judged by the Panel of 'Celebrity' Judges. Kate Kerr's amazing visual aids and beautiful paintings capture her "Working with Nature" presentation. This talk will truly amaze any audience. Kate is amused by Judge Kylie's enthusiasm for her presentation. Did you know Petals have Personalities? 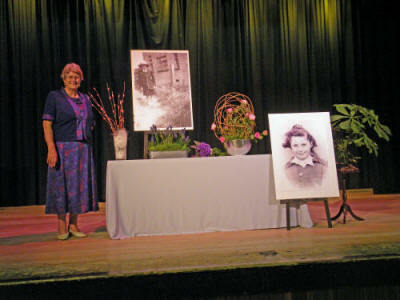 Carolynne Sorrell's presentation explains her reminiscing her life with flowers and foliage. 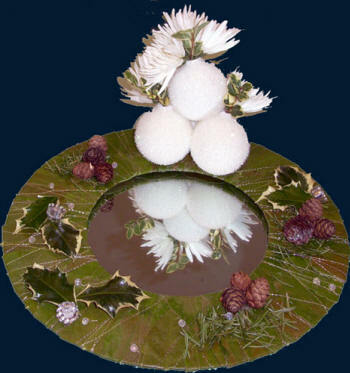 The title of Carolynne's talk is "Petals with Personalities"
Christmas demonstration entitled " The Holly and The Ivy". Valerie's morning session focused upon techniques and the inspiring, more contemporary element of that presentation, was greatly appreciated by an attentive gathering. 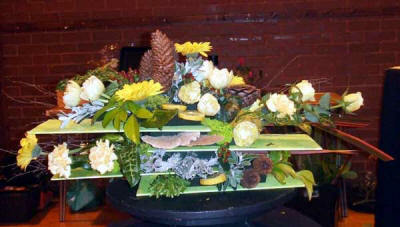 contemporary demonstration entitled " Natures Own"
Teachers' Association November meeting was held in Edinburgh where Mrs Lilias Hoskins, National Demonstrator, gave an excellent Christmas demonstration to a well attended gathering. This followed a very entertaining morning session when Lilias willingly shared her undoubted skills and presented the members with some wonderful Christmas ideas. 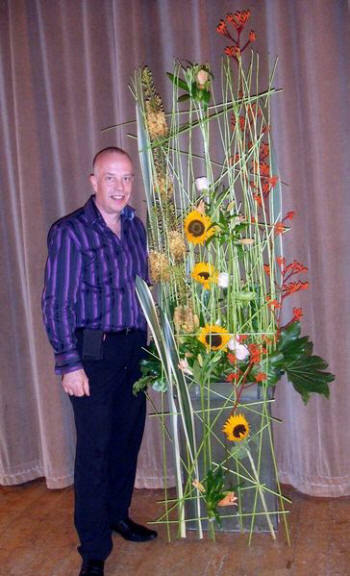 The Teachers Association held a workshop and demonstration by Jo Goldsworthy on 24th April 2008 . The following photos are from the education workshop day held on Friday 18 April 2008 at Bannockburn Community Centre and the day's topic was " Emphasise Contrast of Form and Texture "
We are always looking for new Judges, Demonstrators, Teachers and Speakers so if you are interested please get in touch. If you have any questions regarding any of the above matters then please email the JDE&S Chairman.